Hi, I’m Sarah! I help people use simple-yet-therapeutic exercises to ditch the pain that’s been holding them back from living the life of their dreams. I’m a certified Pilates and yoga instructor with a passion for pain relief, and I recently wrote a book, Snapped: A Helpful Guide for Broken Neck Recovery, about when I recovered from my broken neck. When I’m not working with clients, I’m researching the best ways to get rid of pain. Do you want to learn how to practice yoga and Pilates safely in your own home? Or, do you want to know all my tips and tricks for pain relief? Just follow this link to join my mailing list and receive your free goodies. Inside: In order for a massage tool to help, you have to know how to use it. Here’s absolutely everything you need to know about the Orb massage ball to get started rolling right now! To release the fascia directly beneath the skin, you need to have a grippy-surfaced object that will keep hold of your skin as you move across it. 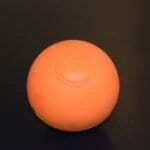 On this website, there is a video of a man using a grippy ball to break up myofascial adhesions in his quadriceps. The manufacturer of the ball was not listed, and there was no link to a store where I could buy it. Naturally, I wandered over to Amazon and began looking around. I found The Orb. It doesn’t look like much. In fact, I was pretty sure that I was going to write this piece then send it back or maybe donate it to a local resale shop. However, from the first moment I used The Orb, I knew I would be keeping it. In fact, it goes with me to work, and then it comes home with me. I hide it up high so my kids can’t find it. Right now in my life, it is very important. against the grain of your muscle. This movement against the grain of the muscle is known as “strumming.” Strumming is a great way to break up myofascial adhesions. Move nearby limbs from the joints. For example, if you have the ball under your quadriceps, bend your knee. If you have the ball under your upper back, move your shoulder. When you are working your piriformis, open your leg from the hip. Rotate your legs. On almost any of the exercises with the legs, you can feel several different muscles if you rotate your leg open to the side and then turn it in toward the midline of your body. 3. Use The Orb on the ground or against a wall. When you use The Orb against the wall, it will greatly reduce the intensity. Remember, if you are on your back on the floor, gravity is helping you get a little deeper into your release. 4. The surface of the ball helps it stay put better than other balls (like tennis balls) would. The Orb stays put really well when it is used on the wall. It also stays put really well when I use it on a yoga mat or on the hardwood floor. However, it was very slippery when I tried it on carpet. 5. Because The Orb is a ball, it can really get into some tricky spots. The distribution of pressure across a surface means that the largeness of the ball helps the myofascial work feel less intense than it would with a smaller ball. Since The Orb is so versatile in terms of what direction you can move while on it, I’m just going to tell you how to access the muscles. It’s up to you to roll, circle, zigzag, strum, rotate limbs, etc. Basically, get on the ball, play, and do what works for you. Please do make sure that you NEVER roll on your spine. Next to it is fine, but never roll across it. Also, NEVER roll the back of your knee. Glute. Sit on the ball so that your hips are level. Find the muscles from the top of the back of your pelvis to your SITs bones. Piriformis. When you’re sitting on the ball, rotate into the ball so that it feels like it is sinking into your hip socket. This is a great opportunity to open and close your bottom leg. Hamstring (back of your thigh). You can start the ball quite high up (near your SITs bones) and let it work down to just above the knee. This is a great opportunity for strumming and rotation. NEVER ever try to work the back of your knee. Calf. You can work from just below the knee to the top of the heel. To get a good amount of pressure, you might need to cross one leg over the other. The ball should be under the calf of the bottom leg. Tensor Fascia Latae. Place the ball on the outside, top of your hip just like you did for the IT band. Now, tilt forward so that the ball rolls more toward the front plane of your body. Essentially, you are rolling the area from just behind your hip bone to the top of your femur (thigh bone). Quadriceps (front of your thigh). Begin on your stomach with the ball up near your hip. Work your way down your leg however feels best. I prefer to do an Army crawl with my forearms and non-working leg to move myself forward (allowing the ball to roll down my leg). At various points along the way, you should bend and straighten your knee. Adductors (inner thighs). While on your stomach, bring your leg out to a forty-five degree angle. Place the ball near where the leg joins the hip. Do not put the ball in your crotch. Tibialis anterior (shin). This one is a little tricky, but if you are prone to shin splints, it’s worth the effort. Begin on your hands and knees. Place the front of a shin on the ball. Use your hands and other leg to stabilize you as you roll the ball. To apply more pressure, start in a crouched position where your non-rolling leg’s foot is on the floor. Feet. This isn’t the absolute best way to access the muscles of the foot, but it works in a very generic way. Simply stand with your foot on the ball and roll it. I tend to do more upper body work with the wall, but it can be done on the floor. Pectoralis minor/major (chest). Face the wall. Place the ball on the front of your body in the space diagonally up from your armpit. Roll on anything that is not bone. Don’t try to roll on your clavicle (collar bone) or sternum (breast bone). Upper trapezius (neck). Place the ball on your back where you would want to receive a shoulder massage. Explore from there. Middle and lower trapezius (rib cage). Because of the solid structure of the rib cage, I don’t spend a lot of time on this one. However, it’s great to open up the spinal muscles that are further away from the spine. Serratus anterior (armpit). Roll on to a side and reach that arm out straight. The ball will go right below the armpit area, and you will roll the outside of the rib cage. Quadratus lumborum (QL)/Psoas (low back). When working this area, you will roll from the bottom rib to the top of the pelvis. For many people, the QL and/or psoas are culprits for low back pain. Around the edge of the front of the pelvis. Be careful when you do this. There are many organs here that are very sensitive to pressure. I roll this area to break up scar tissue from my c-sections. Please don’t do this if you have ever had any inguinal hernias. If you’re interested in getting The Orb, please use this link through Amazon. It doesn’t cost you anything, but I get a sales commission. Here is a video for my visual learners. I hope this helps you get the absolute most relief from your rolling sessions with your Orb. Please make sure to stop rolling if you ever feel intense pain. The whole point of rolling with the Orb is to help you feel better. Sometimes you might feel uncomfortable, but you should never feel like you’re in pain. Thank you for reading this article. Sign up to receive your FREE digital guide, How to Get Rid of Pain Anywhere on Your Body! 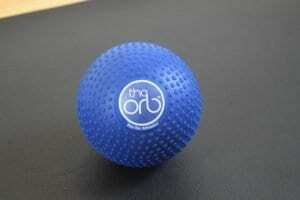 Do you have any special ways you roll when you use the Orb massage ball? Let us know in the comments below. Hi! 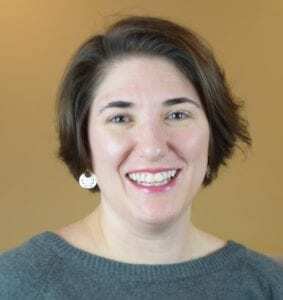 I'm Sarah, and I'm a certified Pilates and yoga instructor with a passion for pain relief. When I'm not working with clients, I'm researching the best ways to get rid of pain. Do you want to learn how to practice yoga and Pilates safely in your own home? Or, do you want to know all my tips and tricks for pain relief? Join my mailing list and receive free goodies to help you.